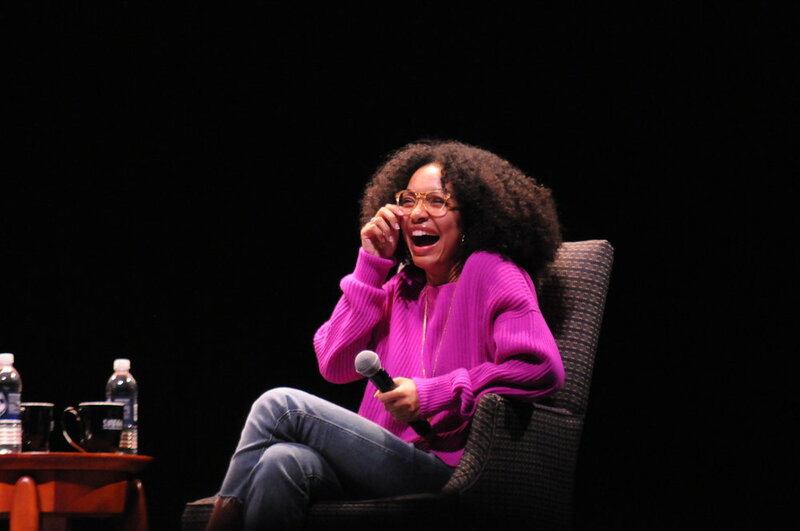 Actress, model and activist Yara Shahidi took the Jorgensen stage Saturday night to share her message of equality and inspiration to University of Connecticut students in a moderated conversation hosted by SUBOG. Wawa Gatheru, the Undergraduate Student Government (USG) vice president and sixth-semester environmental studies major also serves as the student co-chair of the metanoia. She opened up the moderated conversation with Shahidi by introducing the metanoia theme. The conversation with Shahidi was moderated by Milcah Sajous, an eighth-semester human development and family studies major, the vice president of the UConn NAACP, SUBOG community development chair, an RA on campus and an active member of the H. Fred Simons African American Cultural Center (AACC), which celebrates its 50th anniversary this year. Shahidi and Sajous primarily focused on her activism and how it relates to her career in the acting industry. Shahidi’s values on family, education and equality were also central to the conversation. Shahidi, who stars in her own spin-off series, “Grownish,” on Freeform and was a leading cast member on ABC’s “Black-ish,” spent much of the evening talking about growing up in Hollywood and with notable family members. Her mother and brothers were present in the audience and Shahidi attributed her family dynamic to her outspoken nature today. Shahidi constantly addressed her privilege throughout the night, expressing humble gratitude for all the opportunities she’s been provided and the platform she’s been given to act as a voice for young people. She spoke on the media as a nuanced institution with different levels of representation and the importance of television infrastructure matching the stories a show is going to tell. Shahidi praised her own producer, Kenya Barris. She acknowledged her own intersectionality when she spoke about the importance of reflecting different stories on TV and in movies. “I can’t choose between being a person of color and being a woman. I’m both when I wake up,” Shahidi said. She also talked a lot about her love of history and understanding other cultures, and understanding her position in a global society. When asked about the recent criticism that this generation lacks any powerful black leaders, such as Malcolm X or Dr. Martin Luther King Jr., Shahidi shared that she doesn’t think there is a need to replicate those public figures, but to learn from and be inspired by them. Shahidi spoke a lot about her influences, including relatives, educators and people like Lena Waithe, Kenya Barris, Iddris Sandu and more. “My list is always expanding with family, peers, people I admire from a distance and people I haven’t met at all,” Shahidi said of her mentors. When she spoke about her future being “policy-adjacent” and working in a space where she informs policy and content creation, it’s clear why she was accepted to Harvard. Shahidi is humble and intelligent. After the evening was over, the audience had a whole new reading list, as well as podcast and essay recommendations. During the audience Q&A portion of the evening, there were questions about her role as Zoey Johnson on “Black-ish” and “Grown-ish” but also inquiries on her recommendations for improving the campus. There was also a touching question from a young girl and her mother about embracing her natural hair, in which both Shahidi and her mother offered support. During a sit-down with Shahidi after the event, she spoke to the Daily Campus about the importance of coming to universities like UConn and connecting with college students. She also discussed the importance of her show being set on a college campus and taking the time to address topical social issues. There was one key message that Shahidi wanted UConn students to take away from the conversation hosted by SUBOG and the AACC. Shahidi turned 19 the day after visiting UConn. Judging by the enthusiasm with which the audience sang “Happy Birthday” to her, she has the support of college students. As a young person herself, Shahidi is certainly affecting change, especially concerning apathy, policy, equality and representation. It’s clear she will continue to be an individual, an influencer and a powerful voice for our generation in only the most positive light; the university was lucky to have her contribute to the metanoia this semester.